At some point in our lives we have all dealt with or suffered from worry, stress, doubt and anxiety. When you see bills piling up and your not sure how you're going to pay them, when you experience an injury that makes you wonder if you’ll ever be able to play the sport you love, when you’re questioning your salvation, or when your wondering if you're about to lose your job, these are just a few of life’s many trials that can cause you anxiety, worry, stress, and even doubt. It wasn’t until I was in my senior year of college that I can say that I learned to breath, pray and then let go of all those emotions that had absolutely no positive effects on my life. I mean think about it, the last time you were worried and losing sleep over an issue, or so stressed out to the point it made you sick, did those emotions serve any positive effect in your life? For me, ten times out of ten it only added to the trial I was experiencing. I have come to the point in my life where after I have done everything I can do, and the rest is out of my control, I have to give it up completely to the Lord. It also helps when I take a second to just breathe and think about times in the past when I was going through another trial. Every single time God CAME through for me. It might not have always been the way I wanted Him to solve or help the issue but He always took care of it. What I love about the bible (when I’m not going through a dry spell and actually reading it) is that it is full of God’s promises to us! He gives us, direction and even advice on how to deal with life’s adversities. When dealing with life’s trials, I turn to these promises to remind myself that God is in control and working. One of my personal favorites however is Philippians 4: 6-7 it states: Do not be anxious about anything, but in everything by prayer and supplication with thanksgiving let your request be made known to God. And the peace of God which surpasses all understanding, will guard your hearts and your minds in Christ Jesus. In his word, God tells us to not be anxious! That’s a command from the Lord, so every time we are anxious about life we’re actually sinning against God. Let that sink in for a second. Instead of trusting in God’s promises we doubt His abilities or that He cares for us because we are going through a rough time. How silly does that sound, doubting the creator of the world? Yet I have been guilty of doing this all too often. So, how do we shed our anxiousness? Well, God tells us that we should pray to Him with thanksgiving and make our request known to Him. Stressed out, pray. Worried, pray. Anxious, pray. I think at times our problems look so big because we have taken our focus off God and put all the focus on our problem. He is so much bigger than our problems. He's our healer, our provider, our shelter, our everything, sometimes we need to remember what we should be focusing on, or rather, who. Lastly, let go! Once you have prayed and have asked God for His help, let go of it and leave it in God’s hands. The end of the verse explains that the peace of God will guard our hearts and minds in Christ Jesus. The peace I experience once I have given my problem or concern to God is like no other because I am no longer dwelling on the issue. When I let it go, I give it to Him completely. My focus is no longer on the trial but on Jesus. The feeling of peace that follows, knowing and believing that God is in control and will work it out all for His glory, is priceless. So when life's trials hit me and I feel anxiety, doubt, worry and/or stress creep up on me I just breathe; remember all the times in the past God saw me through a dark time, pray; I tell God what has me worried and ask Him to take over the situation, and finally let go; I give him all my concerns and no longer worry about the issue! Philippians 4:6-7 has been a verse I have been leaning on heavily this past year, and it has helped me through many situations. I'd like to say that it's easy to go through tough times and that I handle my trials with grace and faith, but that is not always the case. I'm human, and sometimes my emotions act up first, but I am quick to find peace in God through his word. I hope and pray that this blog post can be both a friendly reminder and an encouragement for you as well! What is your favorite or go to verse during tough times? Also, if you ever need a visual reminder to breathe, pray and let go, consider shopping my "Pray" mug here. 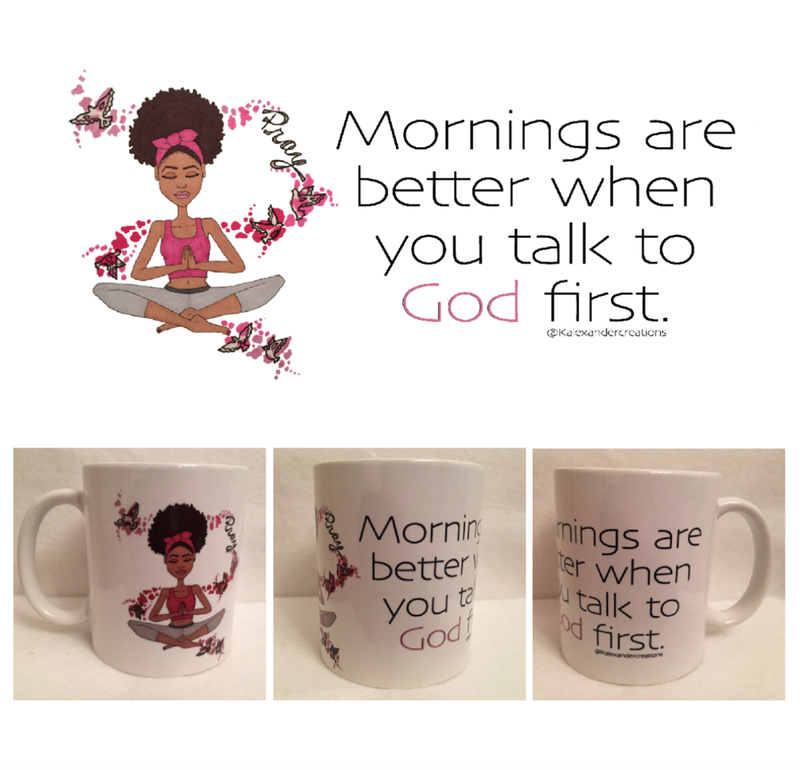 I don't know about you, but my mornings are always better when I talk with God first! Older PostMondeville, a walk back in history!